Full Perimeter Protection ensures your family are safe and sound, with the alarm armed, when you’re at home. The latest in Smart Technology gives you control to arm/disarm the system remotely and monitor other user activity with a smartphone app. 24Hr / 365 Day monitoring, with emergency service dispatch, means you and your family have your own “Guardian Angel”. Crothers Alarm App – remote access via an app on your smartphone. This enables the user to arm/disarm the system remotely and monitor other user activity. Free Comprehensive Home Security Audit – Prior to installation our experts will carry out a check on all doors and windows and make recommendations to improve every aspect of your home security. Unlimited System Maintenance visits to service your alarm, when required. Full Parts and Labour Warranty for 3 years – completely fixed costs for the next 3 years. The very latest in Smart Technology means you have complete control, from Home or Away. Cuts out False Alarms and gives total peace of mind with 24Hr/365 Day monitoring, with emergency service dispatch, means you and your family have your own “Guardian Angel”. To eliminate false alarms caused by pets, for home installations we use special motion detectors that give your pets freedom of movement, while still being able to detect any real intruders. Always-On monitored panic response facility, which is connected to our Alarm Receiving Centre and is monitored 24 hours a day. Break-in emergency repairs to customer premises are covered. Crothers will secure the house in the unlikely event of a genuine or attempted break in. 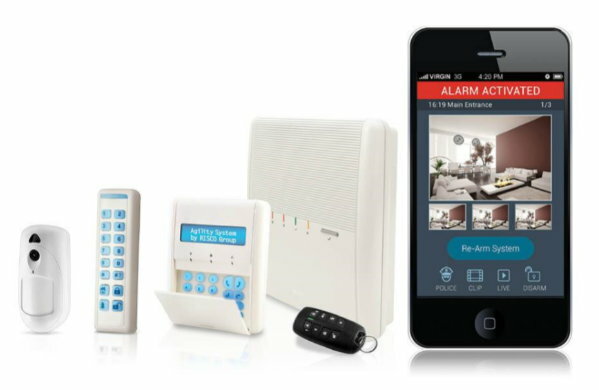 Our alarm systems are wireless – installation is quick and easy. Includes sensors with built-in motion cameras allowing visual confirmation of a break-in. The keypad is simple and easy to use. Choose a Wirefree system for fast no mess installation. Repair, upgrade and install all types of intruder alarm systems for your home. Our engineers have many years of experience in installation and repairs to all makes of alarms. We install and maintain HKC, Aritech, Siemens, GSD, Risco. We provide systems for self monitoring and reporting to your mobile phone and can provide 24hour monitoring. With wire free technology we can install an intruder alarm system to any building type and adjoining sheds or garages within range of the panel. This allows a more flexible system design to suit your budget.